Hitting the bookstores today is Memphian Jennifer Chandler's latest cookbook Simply Suppers, a followup to Simply Salads. Chandler, who studied at Le Cordon Bleu and was co-owner of the much-missed prepared-foods market Cheffie's, took the time to answer questions about Simply Suppers and her new role as spokesperson for French's Mustard. Your new book Simply Suppers offers no-hassle recipes, everything from your grandmother’s eggplant casserole to fish tacos and buttermilk pie. Did you have an audience in mind when putting together the book? Yes, I did have an audience in mind. Folks like me! Even though I’m a trained chef, I am a mom first. I deal with the same challenges of trying to put a delicious, home-cooked dinner on the table after a long day at work or an afternoon of driving the kids around. 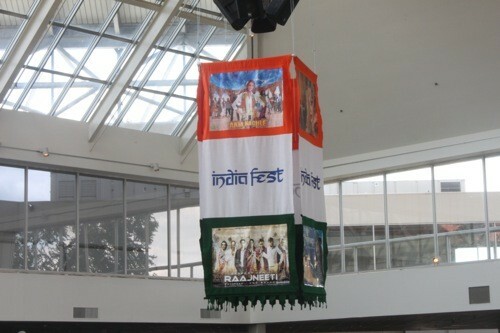 India Fest 2010 packed the Agricenter, and there was plenty of delicious food to be had. Just because there's been a break in the hot weather, doesn't mean you should give up frosty beverages ... like this absolutely delicious green been shake with coconut milk ($3) from Pho Vietnam. I spent half an hour yesterday ripping coupons from Memphis City Saver — so many places I want to try. There was some pre-ordering angst at our table at Dejavu ... there were just too many things that looked good. 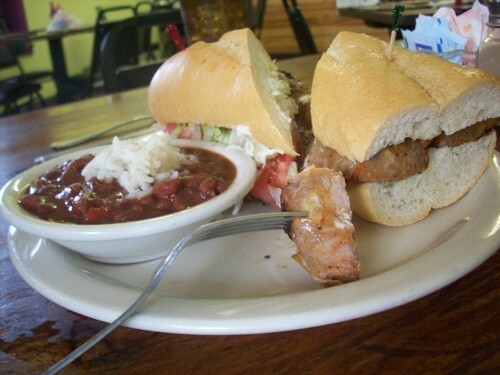 After considering the vegetable plate, Greg decided on the andouille sausage po-boy with red beans and rice. It’s been difficult to avoid the news about the national recall of eggs (nearly 550 million!) due to Salmonella. While it seems the tainted eggs haven’t reached Tennessee, I was still happy to spot Van Cheeseman’s “Join the Egg Club” sign Wednesday at the Botanic Garden Farmers Market. I had heard that Makeda's had ice cream, so I mentioned to Pam that we should stop by after lunch, get a few scoops, and then skedaddle. But then Tamika Heard, who was working behind the counter enthused, "I love talking about our milkshakes." There are a couple of contests of local interest. One to vote in and one to participate in. Vote for Andrew Ticer and Michael Hudman (pictured above) of Andrew Michael Italian Kitchen, who've made the top 20 in an instructional video contest for Protein University. And, Muddy's Bake Shop is holding a T-shirt design contest. The prizes are sweet. Kenneth Reardon, a member of the South Memphis Farmers Market advisory committee, was being put on the spot. St. Patrick's Catholic Church (of which Reardon is a member) has been selling coffee at the market since it opened in July. And the name of that coffee? Seems it doesn't really have one ... until Reardon announces, "St. Pat's Best." As previously noted, the Flyer offices had a clean-up day last week. My area is one of the office's most notable pig-sty: papers and CDs with pictures, little Post-It notes with phones numbers once very important but long forgotten. I did a lot of tossing last week but a lot of saving as well ... as something in one of those piles might, just might, come in handy one day. It's an affliction that follows me home, illustrated so perfectly in the Vegetarian Times magazines I've kept from 2004 that are now mildewing in storage. I've seen that show Hoarders, and I think that I may be only years away from the decomposing-cat-under-a mountain-of-crap scenario. Good thing I don't have any cats. It's been a productive time for a pair of local bloggers. Over at Pam Plants a Garden: tomatoes, okra, and a cantaloupe! And, Midtown Chicks has eggs, including an extra-large one. Burp! : "5 Days of Pizza"
For his birthday dinner, David Dooley knew he wanted pizza but couldn't decide on a place. His solution? Go to five place over five days and invite all his friends along. 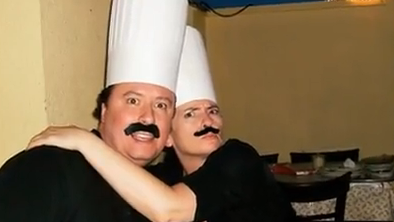 Guests were given paper chef hats and attachable mustaches. The itinerary: Pete and Sam's, Coletta's, Broadway Pizza, Villa Castrioti, and Memphis Pizza Cafe. I was a bit disappointed when the Dagwood Sandwich ($8.95) arrived. Where's the olive garnish? Memphians will get a taste of what Nashvillians have been raving about for some time now: Bravo Gelato. Last weekend, Bravo general manager Noel Glasgow came to town to meet with some restaurateurs and pitch the product. The meeting went well. Starting Saturday, the gelato will now be on the dessert menus of Sweet Grass, Interim, Andrew Michael Italian Kitchen, and Restaurant Iris. “We’re super-excited to be in Memphis, to grow and improve the business,” says Glasgow. Memphis Team on "BBQ Pitmasters"
On Thursday, August 12th at 9 p.m., it’s the premiere of season two of TLC’s BBQ Pitmasters, and it’s a whole different ballgame. While season one followed a group of teams on the barbecue circuit, season two now has a competition-show format, a la Survivor. In each episode, four teams compete. A “Pitfire Challenge” narrows the field to three, and the winning team of each episode goes on to compete in the finale. The prize: $100,000. The September 16th episode features Big Mouth Smokers, a Memphis team comprised primarily of teachers from Southwind Elementary.